Obsidian is a material found naturally in Nether or created in the normal World when a water flux makes contact with a lava source block . 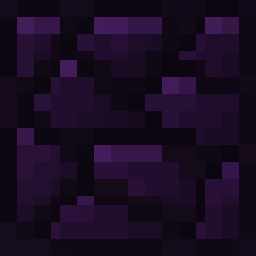 Obsidian can only be mined with a Diamond Pickaxe and is the toughest mineable block. Creepers cannot destroy Obsidian. Nether Eyes, when killed, could drop Obsidian. <gallery> File:My whole Mine Blocks house.png|A Mostly Obsidian house. Click to enlarge.